One woman’s imagination rebels against a world that seeks to entrap her in this feverish tale of vendetta, blood, and madness. This radical and intimate new vision pares Donizetti's masterpiece down to ninety minutes, six singers, and five instrumentalists. The production features a new arrangement of the score by Daniel Schlosberg for piano, cello, clarinet, guitar, and percussion. 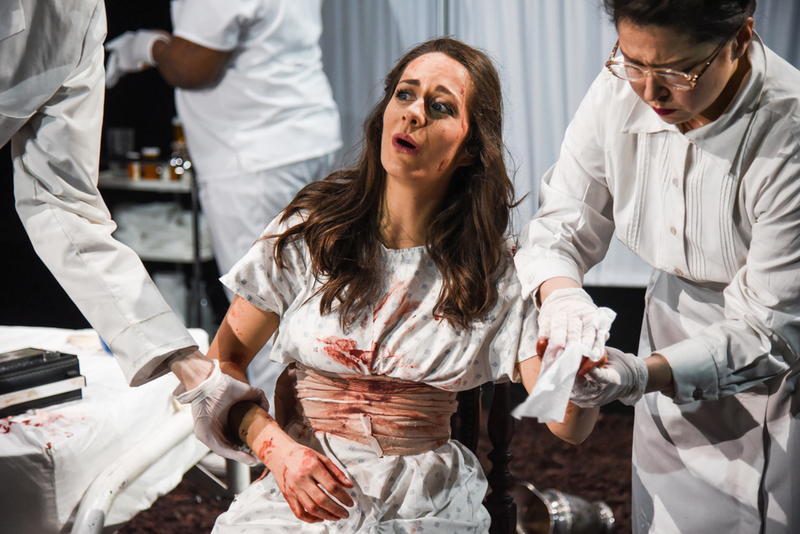 In Louisa Proske’s bold staging, opera is synonymous with the unquenchable desire for a life that will not be contained. Lucia’s tale of daring and passion bursts forth from the heart and brain of a nameless asylum inmate and shatters the silence of her captivity. Colombian tenor David Guzman is quickly rising in the large arena of opera and oratorio. With reviewers praising his exquisite beauty of tone and impeccable musicianship, audiences are keeping their eye on the up and coming tenor as he recently thrilled them in his portrayal of Il Duca di Mantova of Verdi’s Rigoletto with Tampa Opera and Rafael of Foglia/Martinez's To cross the face of the moon with Arizona Opera, Lyric Opera of San Diego, Lyric Opera of Chicago, Houston Grand Opera and performances at the famed Theatre du Chatelet in Paris. Mr. Guzman made his Carnegie Hall debut as a soloist in Misa Azteca by Gonzalez with Mid-America Productions followed by performances of Mozart's Coronation Mass at Alice Tully Hall and Mozart’s Vespers at Avery Fisher Hall with DCINY in New York City. Other credits include The Duke in Rigoletto with North Shore Opera Festival in New York, Rodolfo in La Bohème with Opera in the Heights in Houston, Don Jose in Carmen with Long Island Opera, Nemorino in L’elisir d’amore with Divaria Productions, Alfredo in La Traviata with Bronx Opera and Rinuccio in Gianni Schicchi with Salt Marsh Opera and Edgardo in Donizetti’s Lucia di Lammermoor with Stony Brook Opera. American tenor Christopher S. Lilley has been lauded as "vocally solid and dramatically convincing" by The New York Times, as well as having "a big, bright tenor" by Opera News. A versatile performer of both opera and musical theatre, Christopher had the pleasure of performing most recently as Prince Oko in Opera Ebony’s Imoinda project. Other recent credits include Cherubino in the New York premiere of Rosina with dell'Arte Opera Ensemble Tamino in Die Zauberflöte with the Manhattan School of Music Opera Theatre The Brooklyn native has also performed Tamino in The Magic Flute with the MSM Educational Outreach Program, Cecco in Il mondo della luna with the MSM Opera Scenes Program, and Aristee/Pluton and Orfee in Orphée aux enfers, with the MSM Senior Opera Theatre. has performed with Glimmerglass Opera, Arizona Opera, Gotham Chamber Opera, Broadway’s A Gentleman’s Guide to Love and Murder, The Berkshire Theatre Festival, The Women’s Project, Utah Festival Opera and Musical Theatre, Heartbeat Opera, MidAtlantic Opera, The Metropolitan Opera Guild, Madison Lyric Stage, The Teatro Nacional de Santa Ana, Hand Made Opera in the UK, Yale Opera, New York Festival of Song, American Festival Chorus, Hartford Symphony Orchestra, Waterbury Symphony, New Haven Symphony Orchestra, and has sung in recital with Alan Held, Mark Adamo, Stephen Schwartz, and Richard Paul Fink. Her upcoming engagements includes Musetta in La Bohème (semi-staged) with Bangor Symphony Orchestra; Queen of the Night in Die Zauberflöte with The Orlando Philharmonic; the title role of Lucia di Lammermoor for New York’s Heartbeat Opera; and concert performances with Yale Musical Theatre on the Air as Ethel Toffelmeier in Music Man. Matthew Singer has been praised for his “smooth, rich baritone” and his ability to “give expressive life to phrases and project his voice in handsome ways.” He has performed all over the United States having sung such roles as Enrico in Lucia di Lammermoor, Alfio in Cavalleria Rusticana, Tonio in I Pagliacci, Dr. Falke in Die Fledermaus, Count Almaviva in Le Nozze di Figaro, Danilo in The Merry Widow, Marcello and Schaunard in La Bohème, Guglielmo and Don Alfonso in Così fan Tutte, Grovesnor in Patience, as well as the title role in Rossini’s buffo opera Il Signor Bruschino. He has performed with such opera companies as Seattle Opera, Lyric Opera Cleveland, Asheville Lyric Opera, Opera Company of North Carolina, Virginia Opera, to name a few. Matthew has also sung extensively in Oratorio having been a soloist in the B Minor Mass of Bach, The title role in Elijah by Mendelssohn, The Christmas Oratorio of Saint-Seans, the Mozart Requiem, and The Messiah. He has performed with orchestras and choral groups in New York, North Carolina, Ohio, Washington, Colorado, and many more. In the summer of 2003, at the Tanglewood Music Festival, he received international critical acclaim for creating the role of Pierchon de la Rue (Narrator) in the World Premiere of Robert Zuidam’s Rage D’Amours, commissioned by Tanglewood for the 2003 festival. Praised in the Washington Post for her "fluid mezzo soprano" and "delicious acting", Monica Soto-Gil is gaining recognition on the operatic, recital and concert stage. This season, Ms. Soto-Gil made her debut in Mexico in recital at Palacio Bellas Artes in Mexico City, D.F. with world renowned guitarist, Roberto Limón, performing the works of Falla, Guastavino, Theodorakis and Granados. Also in the 2015 Season, Ms. Soto-Gil made her role and company debut as Maddelena in Rigoletto with Hubbard Hall Opera. Past season's highlights include solo performances with the Inscape Chamber Orchestra at the National Gallery of Art and a concert of Mahler’s work with the University of Maryland Symphony Orchestra. She was also a member of the Ensemble in The Santa Fe Opera's 2014 Festival Season’s Fidelio. 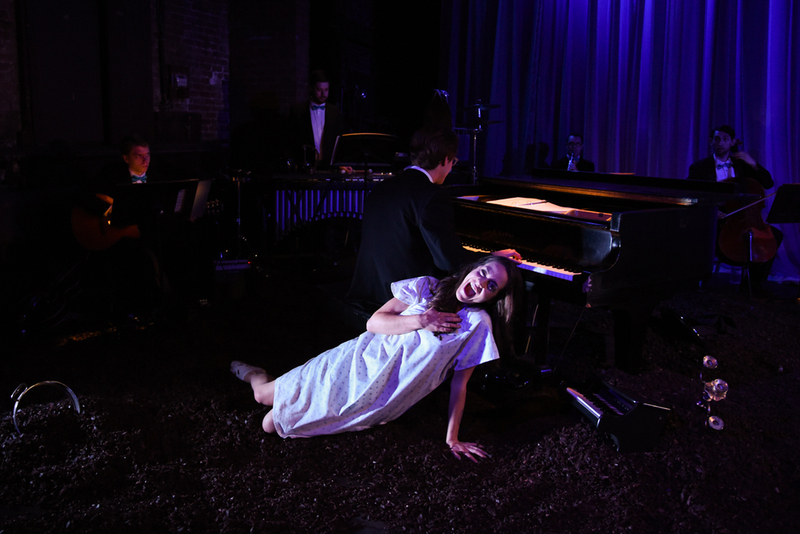 Spending the summers of 2012 and 2013 as a Bonfils- Stanton Foundation Apprentice Artist with Central City Opera, Ms. Soto-Gil performed Mrs. Gobineau in The Medium, Kate in Oklahoma! and covered the roles of Mrs. Gibbs in Our Town and Mrs. Grose in The Turn of the Screw. She also gave a stunning recital of French and American song in Central City’s historic Teller House. Other career highlights include the roles of 2nd Woman and Dido (cover) in Dido and Aeneas with Poor Richard’s Opera, guest soloist with the Young Artists of America orchestra and chorus, as Mrs. Balandard in M. Choufleuri restara chez lui with Bel Cantanti Opera, the Alto soloist in the Mozart Requiem with Capital City Symphony, Rosina in Il Barbiere di Siviglia, Paula in Florencia en el Amazonas, and Marva (cover) in the world premiere of Shadowboxer with the Maryland Opera Studio. Recent choral credits include The Metropolitan Opera’s 2013 production of Parsifal as a member of the female chorus and performances with the New York Choral Artists under the batons of Gilbert, Labadie and Mehta with the New York and Vienna Philharmonics. Ms. Soto-Gil received her Bachelor of Music from the New England Conservatory of Music in Vocal Performance under the tutelage of the late Edward Zambara. She earned her Master of Music as a member of the Maryland Opera Studio where she studied with Delores Ziegler. Ian Gottlieb (b. 1990) is a Brooklyn based composer/cellist, where he is a core member of ensemble Invisible Anatomy and principal cellist of Contemporaneous. In addition to being an avid performer of new music, Ian has performed with numerous pop artists, including tours with the Trans-Siberian Orchestra and Air Traffic Controller at major venues such as the House of Blues (Los Angeles), the Coliseum (Hampton, VA), Mohegan Sun (CT), and the Verizon Arena (NH). A Los Angeles native, he holds degrees from the Yale School of Music, Boston University, and Crossroads School for the Arts and Sciences. Belarus-born multidisciplinary artist Gleb Kanasevich has been acclaimed as a soloist, chamber music collaborator, interpreter of new music, and a composer. He has appeared as a soloist with groups like Baltimore Symphony Orchestra, Belarus National Philharmonic, Peabody Symphony Orchestra, Peabody Chamber Orchestra, Peabody Camerata, soundSCAPE Ensemble, Lunar Ensemble, and many more. He keeps a consistent schedule of solo recitals mostly focused on extremely virtuosic contemporary solo works for clarinet, bass clarinet and recorders. John Kossler started his guitar studies through the Suzuki Method with his father, William Kossler, at the age of four years old. He eventually attended the North Carolina School of the Arts in Winston Salem, North Carolina, studying under Joseph Pecoraro. Placing in competitions such as the ECU Guitar Festival in Greenville, North Carolina, the Young Arts Festival in Miami, Florida, and the Music Academy in Greensboro, North Carolina, John then attended Wake Forest University, studying under Patricia Dixon. During his education at WFU, he performed in Europe at cities including Milan, Italy and Postojna, Slovenia. Currently John attends the Yale School of Music pursuing a Masters of Musical Arts degree in guitar performance with Ben Verdery. Hailed as a "fine soloist" (NY Times) and "a stand out among unfailingly excellent performances" (The Boston Globe), New York City-based percussionist Bill Solomon performs with Ensemble Signal, having appeared at Lincoln Center, Tanglewood, LA Philharmonic, Guggenheim, Miller Theatre, Big Ears Festival, June in Buffalo and the Stone. He performed the solo vibraphone part for Boulez's Répons in collaboration with the Lucerne Festival, IRCAM and Ensemble InterContemporain with Mr. Boulez as conductor. Mr. Solomon has performed with Talujon Percussion, Hartford Symphony, Alarm Will Sound, Talea Ensemble, American Modern Ensemble, Sound Icon, Callithumpian Consort, Yale Repertory Theatre and Philadelphia Chamber Music Society. Rebecca Azenberg a New York City native, is a graduate of the School of American Ballet, LaGuardia High School of the Performing Arts, and Columbia University. Dance credits include corps de ballet with the Pennsylvania Ballet, Black Swandirected by Darren Aronofsky, and Christopher Wheeldon’s Swan Lake premiered at the Edinburgh Festival. Management credits include the Wicked First National Tour, I’m Gonna Pray For You So Hard, Guards at the Taj, and Dada Woof Papa Hot.Thanks to Mom, Dad, Jess, Josh, and Maggie! Bo Frazier is happy to be returning to Heartbeat after assisting Louisa on Daphnis & Chloe last year! Originally from Indianapolis & relocated to New York City in 2014 from London where he co-founded the Off-West End ‘‘Offie’’ Award-nominated London Theatre Workshop. He is the Co-Artistic Director of NYC based ensemble HoosierMuse who just presented their first original music/theatre piece Konstantin at Dixon Place which he Co-Created and Directed. Directing Credits include the Off-West End Premiere of The Dinner Party (Greenwich Theatre), Haunting Julia (Manor Pavilion Repertory) and Waiting, or the Illusion of Safety (Rutgers University.) He also served as Associate Director for the Original London Production of Bare: the rock musical. Training: BA - Millikin University, MA - Birmingham UK School of Acting. Recent credits include costume design for Daphnis & Chloé, Kafka-Fragments (Heartbeat Opera); Macbeth, Stabat Mater, the little match girl passion (Glimmerglass); Blueprints To Freedom (La Jolla Playhouse, Kansas City Rep); Engagements (Barrington Stage); God of Carnage, By the Way Meet Vera Stark (Juilliard); The Changeling (Red Bull); The Other Thing (Second Stage Uptown); Soldier X (Ma-Yi); Smoke, My Daughter Keeps Our Hammer (The Flea); and Wyoming (Lesser America). She holds a BFA from Boston University and an MFA from NYU/Tisch. Chloe Treat is a New York based director and choreographer. Born and raised in the great, if not occasionally problematic state of Texas; she directs and choreographs musicals, plays, operas, outdoor dance rituals and feminist westerns. Chloe’s work centers on the curation and creation of modern mythologies, and investigates how theater can act as ritual and inspire communal awe. Recently, Chloe has worked on The Good Swimmer at HERE arts, Natasha Pierre and the Great Comet of 1812 at A.R.T and Amelie the Musical at Berkeley Rep. Chloe is thrilled to be returning to Heartbeat Opera for their second season. Oliver is happy to be working with Heartbeat again, having designed Kafka Fragments and Daphnes and Chloe last year, as well as the benefit performances of Miss Handel and The Fairy Queen. Recent credits include Empty the House (Curtis Opera), Bells are Ringing, A Little Night Music (Berkshire Theatre Festival); peerless (Yale Rep), Accidental Death of an Anarchist (Yale Rep, Berkeley Rep); Erismena (Yale Baroque Opera); Tar Beach (Luna Stage); Grace, The Other Room (TBG Theatre); Sunday in the Park with George, Sagittarius Ponderosa. (Yale School of Drama). Upcoming: House Rules (Ma-Yi). BA Hunter, MFA Yale.